Having grown up as the son of an Episcopal minister, I had an early interest in religion. Yet one of my issues with organized practices was that an intermediary between myself and God – be it a priest, a book or a messiah – was often required. Even as a teen I’d had enough spiritual experiences to know these weren’t necessary. My subsequent relationship with the divine has become personal and unfiltered. Nature provides all the church I need. The unconditional love of a pet a truer reflection of God than any sermon. Thus, the emissaries shown here reflect both the absurdity of religions as big-business spiritual tour guides, and the fact that any experience can be a doorway to a deeper awareness. Granted, religions often help individuals out of crisis and can be a positive force for social causes. But, give me a smile on a dog any day to remind me of my own divine nature. 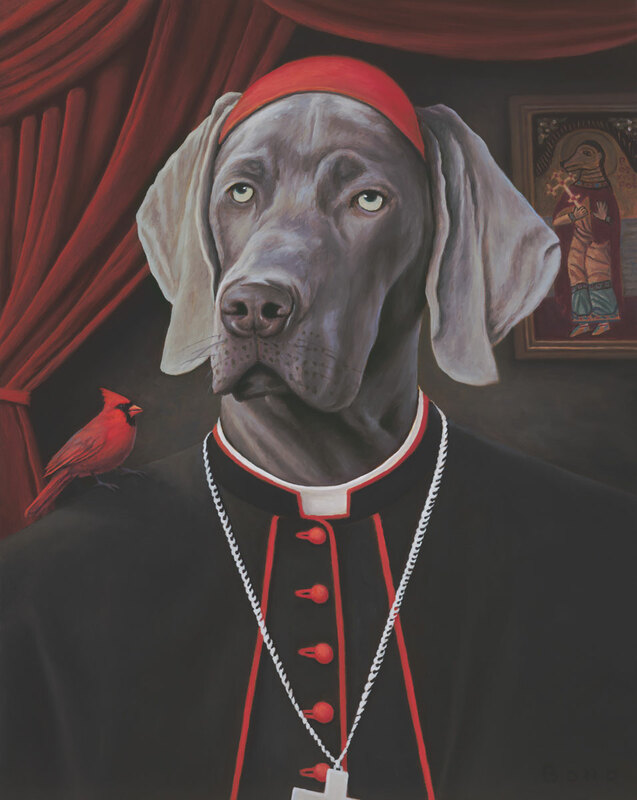 Perhaps an entire order of dog priests… with a bird choir? Now that’s a church I could join.